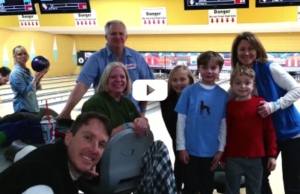 What a wonderful time we had at Midtown Bowl on Saturday, February 21st at The Peters Company Pet Bowl! We were overwhelmed with everyone’s support of this event in honor of Angels Among Us Pet Rescue. Before the Pet Bowl even began, we received $260 in donations for AAUPR from our clients, friends, and family who couldn’t attend the event! And, the love and support kept rolling in during the Pet Bowl as YOU all contributed $768 to Angels Among Us. To top it off, The Peters Co threw in $5 per strike! We had fabulous bowlers in attendance who bowled a total of 83 strikes! So, with your donations and The Peters Co strike match, a total of $1183 was contributed to Angels Among Us! Angels CEO, Lance White, was there to accept the donation! We are truly grateful for such wonderful clients, friends and family – a true group of givers! Also, a big shout out to Campbell and Brannon for co-sponsoring the event with us! ← Just Listed :: Amazing View in Vinings Overlook!